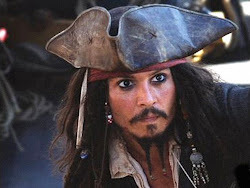 Snippets of Jack: "A Full Pardon"
Beckett: "The East India Trading Company has need of your services...We wish for you to act as our agent in a business transaction with our mutual friend Captain Sparrow." Will: "More acquaintance than friend. How do you know him?" Beckett: "We've had dealings in the past. And we've each left out mark on each other." Will: "What mark did he leave on you?" Apparently Beckett has better things to do then answer this question. Beckett: "...By your efforts, Jack Sparrow was set free. I would like you to go to him and recover a certain property in his possession." Will: "Recover. At the point of a sword?" Beckett: "Bargain. [opens his wooden box with the East India Trading Company insignia and removes a leather case and takes out a few sheaves of paper] Letters of Marque. You will offer what amounts to a full pardon - Jack will be free, a privateer in the employ of England." Will: "Somehow I doubt Jack will consider employment the same as being free. "Beckett: "[scoffs softly] Freedom. [puts the papers away and walks out onto the balcony; Will follows] Jack Sparrow is a dying breed. The world is shrinking. The blank edges of the map filled in. Jack must find his place in the New World or perish. Not unlike you, Mr. Turner. You and your fiancée face the hangman's noose." Will: "So you get both Jack and the Black Pearl." Beckett: "The Black Pearl?" Will: "The property you want that he possesses. Beckett: "A ship? Hardly. The item in question is considerably smaller and far more valuable. Something Sparrow keeps on his person at all times: a compass? [Will shows recognition on his face] Ah, you know it. Bring back that compass, or there's no deal. [Beckett walks away] "
If you didn't understand any of that I'll just summarize it in English. Beckett wants Will to go find Jack Sparrow's compass. Will thinks that Beckett means to kill Jack but really he wants Will to trade some documents (Letters of Marque) that will free Jack of his earlier crimes. The reason Beckett wants the compass is because he knows that it points to what you want most. H e thinks that it will point to the heart of Davy Jones which would give the leverage to command Jones. This would be very helpful in the "War Against Piracy" that Beckett is planning. Elizabeth , of course, ruins this whole plan by sneaking out of jail and into Beckeett's office in the middle of the night. She steals these letters and forces Beckett to sign them. Elizabeth: "These letters of marque, they are signed by the king." Beckett: "Yes, they're not valid until they bear my signature and my seal." Elizabeth: "Or else I would not still be here." As usual, she points her pistol at him and makes him sign the pardons before running away with them into the Caribbean. Once on board the Black Pearl, Jack finds these letters and realizes what the Royal Navy wants him for. Amused, he takes the letters from Elizabeth. Elizabeth does a bitter more flirting with him before just letting him take them. However, "complications arose," and instead of Will bringing the compass to Beckett, James Norrington comes with the heart and the Letters of Marque, saving Beckett a lot time and work. You see, while Jack and the others where running around the Isla de Cruces, Norrington stole the heart and the letters from him. He told the others to leave without him, making the others think he was going to be captured. Norrington had better plans and returned to Beckett with the letters of marque, his named filled hin them, granting himself the pardon and renewing his former glory. Beckett: "If you wish to claim these you must have something to trade. Do you have the compass?" Norrington: "Better. The heart of Davy Jones." As reward Beckett makes Norrington an Admiral and gives him his old sword, the one Will Turner made.